Farmersgirl Kitchen: Tapas Tasting at La Tasca! 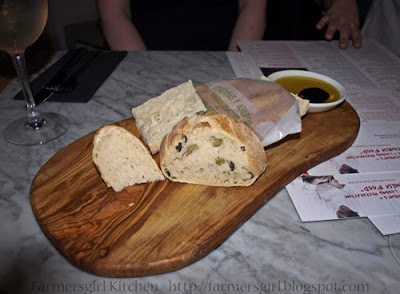 We started with the Spanish Rustic Bread Board, freshly baked Spanish ciabatta, onion and olive and an really interesting torta (a crispy, rosemary and thyme bread biscit from Seville). This was served with an extra-virgin olive oil and sherry vinegar dip. The torta is the one wrapped in the waxed paper, it was a bit like really good rough puff pastry, with layers of crispiness. All the breads were good and 'Delisioso' dipped in the oil and vinegar. These dishes are part of a new menu which has been developed for La Tasca by Executive Chef Antonio Bennetto using as many authentic ingredients as possible. On this plate from left to right Croquetas de Manchego, hand crumbed Manchego cheese and fresh spinach; Croquetas de Pollo - hand-crumbed chicken breast both are served with garlic mayonnaise; Patas Bravas - fried potatoes with spicy tomato sauce. 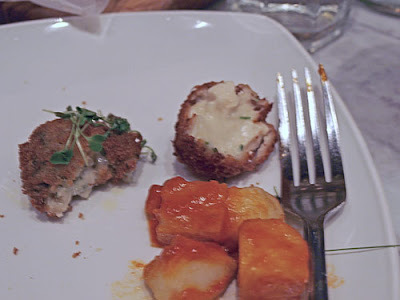 The Croquetas were crispy with tasty fillings, I wasn't so impressed with the Patas Bravas which was a bit soggy, the potatoes not fried enough, the sauce was just spicy enough but I've had better. 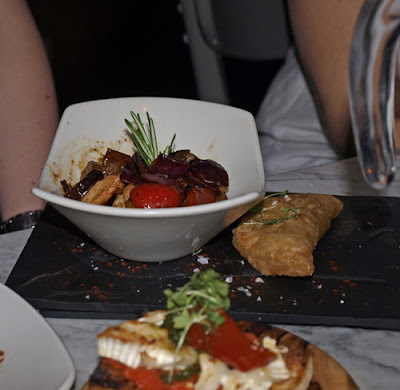 There were two Tapas dishes that I really loved, one was the Spanish Style Lemon Chicken shown in the little white dish above, it tasted divine with a lovely sticky lemon glaze on chicken and mediterranean vegetables. 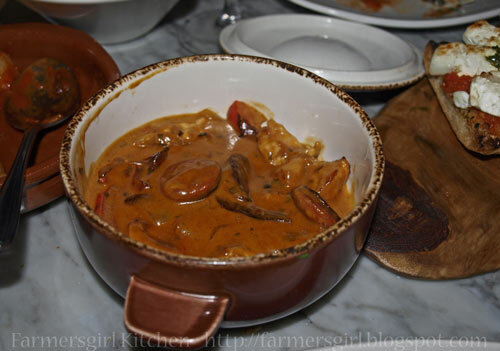 The other dish I loved was the Festival of Mushrooms, I don't have a photo but it would look like a dish of sauted mushrooms, but the taste - WOW! According to the menu it is afestival of chestnut, button and porcini mushrooms sauted in garlic butter and white wine. We all agreed that it was one of the stars of the night. This dish is Pollo Marbella, chicken cooked with smoked paprika, chorizo, mixed peppers, onion and a white wine and cream sauce. It had a real depth of flavour and piquancy. 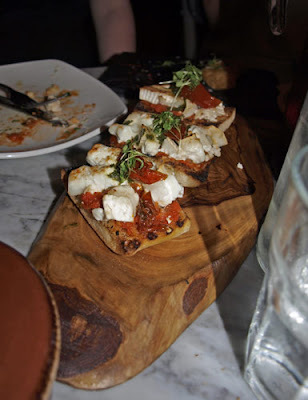 Vegetarians were not neglected, there are lots of dishes 'From the Vegetable Garden' and this goats cheese and tomato ciabata slices called Montadito 'La Tasca' was a real winner. As you can see all the food is also really well presented. Now for a bit of a Spanish pronunciation lesson! and finally, here are the select bunch of Scottish Food Bloggers who were invited to dine at La Tasca, many thanks to Becca, the PR, and to Suzanne the General Manager at La Tasca, Renfield Street, Glasgow. 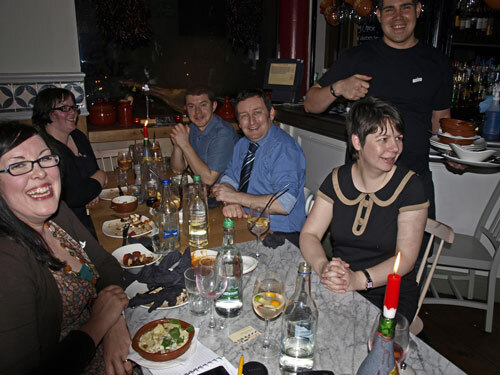 I would definitely return as I really enjoyed the food, the service and the general relaxed ambiance. I love the pictures and the food looks so wonderful! I'm so annoyed I couldn't;t make this event! Would have been great to meet you at last and sample all the wonderful food. I love La Tasca and always order too many tapas but somehow manage to eat them all! Your grin with the large glass of sangria on Jacqueline's blog was fantastic! It was huge!